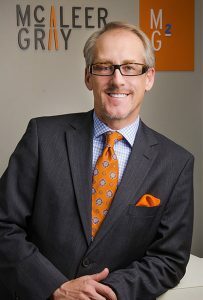 Brad Gray is a Founding Partner with McAleer Gray. He has over 15 years of executive search experience and was previously a partner in the Denver office of Korn/Ferry International. While with Korn/Ferry, Brad led the firm’s global wireless telecom sector and co-led the overall communications practice. His clients have included high growth, early stage companies, as well as large established firms in telecom, technology, energy, call center and other industries. Brad is also a co-founder of Wayport, which pioneered the global deployment of public WiFi. Wayport was purchased by AT&T in late 2008. He has also served as Vice President of Operations for AT&T Wireless (McCaw Cellular) and Vice President of Business Development for STS HotelNet. Additionally, Brad served as CEO of Itatel, a Sao Paulo, Brazil-based telecom holding company. Mr. Gray maintains numerous contacts in Brazil, and is conversational in Portuguese. He has a well-rounded background with extensive operational and strategic leadership experience and received a Bachelor of Science in business administration from the University of Arkansas. …View all Executive Search services and Practice Areas.